Where: TheMotherhood – here is the link to the page where the class will be held. 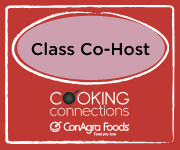 And here is the registration page for all Cooking Connections classes. What: The class I am co-hosting is called “Creating an Efficient Kitchen,” and it is hosted by Jodi Grundig (Mom’s Favorite Stuff), Sommer Collier (A Spicy Perspective) and Tricia Callahan (Once a Month Mom). During the class, all of us will share tips and tricks on topics ranging from efficient grocery shopping to creating delicious and inexpensive meals to stockpiling food and freezer meals. Join me and these knowledgeable foodie moms in TheMotherhood to transform the way you operate in the kitchen!